For Jose Cuervo's Cuervo Games, a competitive driven event coupled with a live interactive online broadcast, Digital Kitchen created several key elements highlighting the Cuervo brand. The games themselves are a series of obstacle courses where teams compete for trips and prizes. During the competition, the games are broadcast online via Justin.tv with hosts Blair Herter and Jessica Chobot extending the viewing audience from hundreds to several thousand. The first event was held in Orlando during the afternoon and evening of March 6 and will be touring throughout the United States during the spring and summer of 2010. One of the many goals, outside of creating a stellar event for the audience, was to integrate the hardscape, scoreboard and online broadcast to create a holistic experience. Inspired by the 1968 Mexican Olympic games, we developed a strong visual language to guide design decisions. 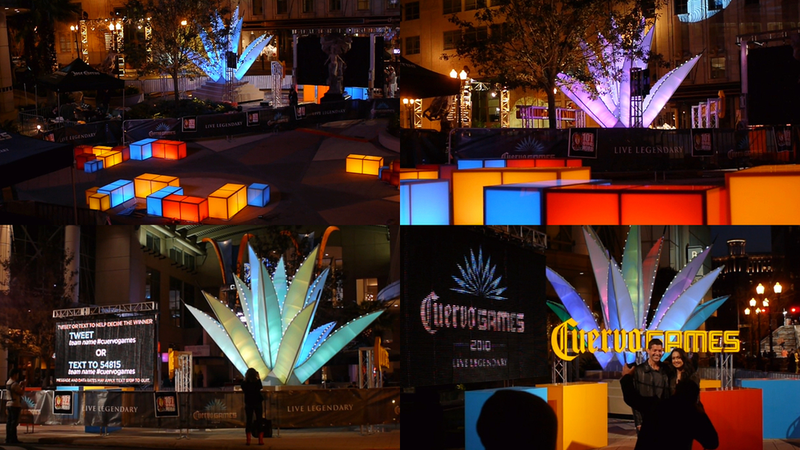 The idea was to create big iconic elements, from graphics (the event icons) to the bigger constructed elements (the large agave sculpture), that could function as wayfinding, branding and identity for the Cuervo Games. The three components Digital Kitchen created were light blocks, an internally illuminated agave sculpture, and an online broadcast toolkit.